Accompanying our clients, each one of our unique projects is personally overseen by our company’s founder and owner. We take great pride in the fact that the majority of our work is done by our own skilled team of artisans. 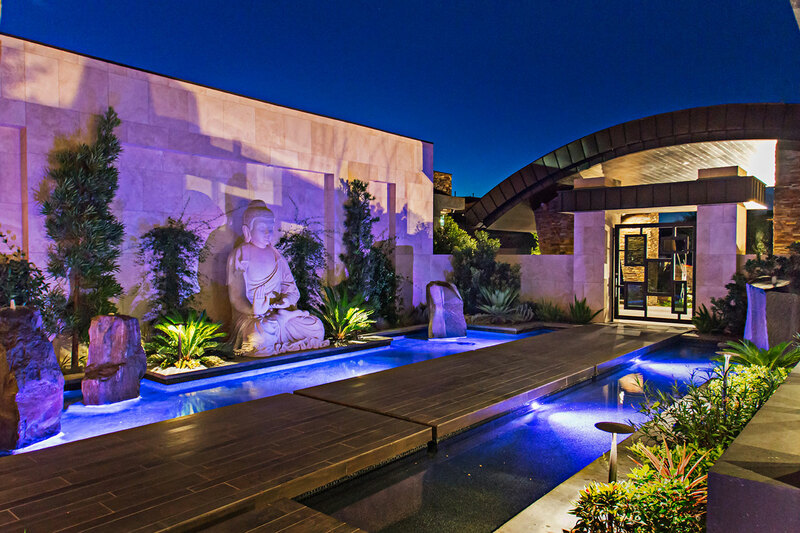 At Laguna, we believe landscaping is a living art form that seamlessly blends hardscape (structures) and softscape (plant material) to create a beautifully functional room without a ceiling, comfortable day or night. Our designers take an organized approach to each custom landscape plan addressing practical matters such as delineating space, buffering noise, camouflaging unwelcome views and ensuring privacy. Time is devoted to understanding the family's needs and desires to create an environment with personality and purpose. Accompanying our clients on nursery walks assures that healthy plant material that is appropriate for the intended placement on the property is selected. 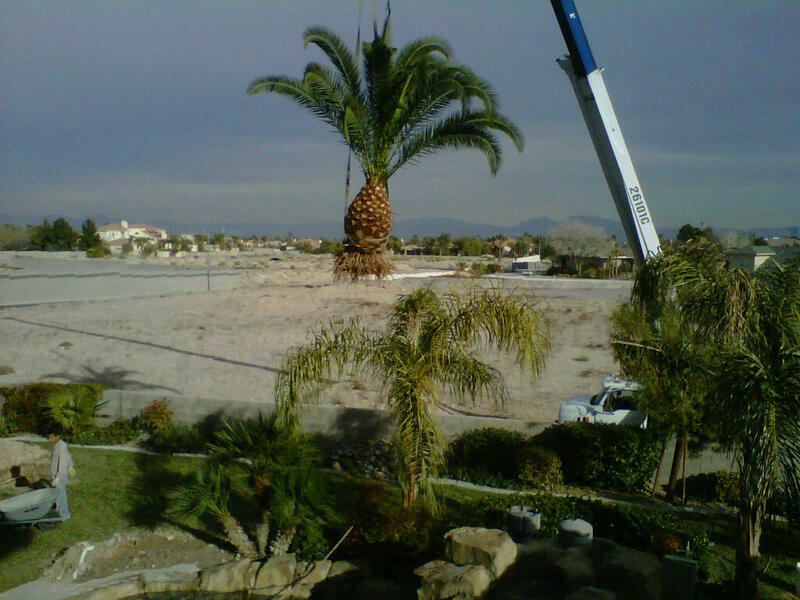 Prior to installation, the soil condition is assessed and improved helping the vegetation thrive in our harsh Southern Nevada climate. We often recommend drought tolerant succulents that erupt in vibrant yet delicate flowers. But, the overall look is determined by the personal preferences and lifestyle of the homeowner. 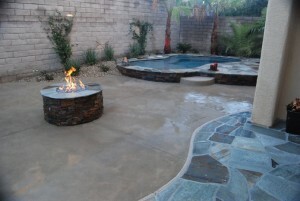 The end result is always a unique desert oasis rich in color and texture making your all too limited free time at home more relaxing and enjoyable. Developing a close relationship between designer and client is as important as creating a landscape plan that blends the home with its surroundings. 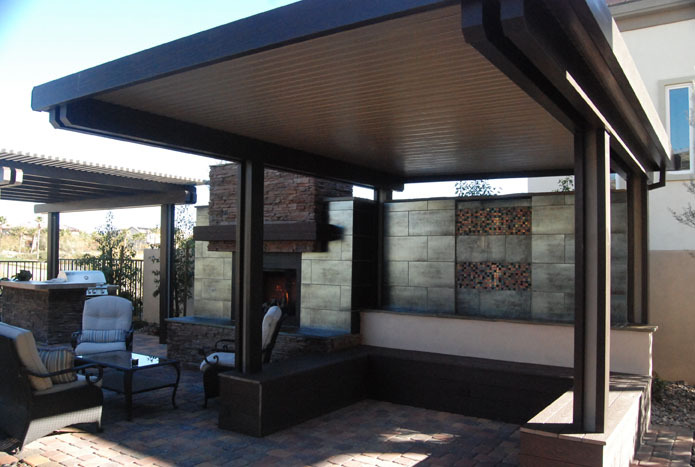 The design professionals at Laguna begin with a complete site analysis taking the time to ascertain your needs and desires to conceive an outdoor living space that is reflective of your individual style and personality. The challenges posed by each site and structure serve as inspiration for our designers to achieve innovative solutions. Our designers will create for you a 2D or 3D CAD (computer aided design) outdoor living design concept plan that will serve as an overview of the layout, with precise measurements detailing the placement of hardscape elements and plant material. Twenty years of experience beautifying Las Vegas has established Laguna as experts in the custom landscaping industry. Our design and construction professionals apply their vast knowledge and training to devise a comfortable open air setting that extends the useable living area of the house throughout the year. Whether you’re seeking a private retreat, a family friendly play area or a place to entertain or dine alfresco, Laguna will originate an attractive landscape that compliments the home and the lifestyle of its inhabitants. With complete oversight of your project from its inception, knowledge of indigenous plant species and materials and positive relationships with suppliers, Laguna makes the installation process a worry free experience. Structural elements or hardscape provide the foundation to an outdoor living area and are designed to be both functional and aethetically pleasing. The type of structure and materials used is dependent on individual needs and taste and can either compliment or contrast with the surrounding landscape. Whether you are using hardscape to create a focal point, instill motion or delineate space, they add dimension, balance and a sense of permanence to an open air environment. 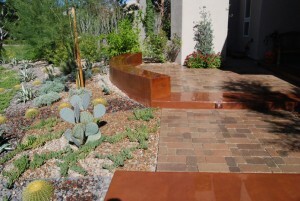 Often used to describe desert landscaping, Xeriscape is actually a landscape technique based on water conservation principles that apply to every garden style and are applied at Laguna. Developed by a Denver, Colorado task force, the seven principles of Xeriscape are Planning & Design, Soil Improvement, Appropriate Plant Selection, Practical Turf Areas. Together, all of these ideals produce a colorful, lush landscape that conserves the most precious resource in the desert – water. 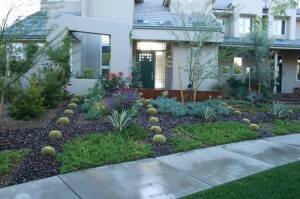 Laguna applies the principals of Xeriscape to create an oasis that saves homeowners time and money. In the southwest where the climate is mild, outdoor kitchens have become increasingly more popular and take dining alfresco to a whole new level. Whether entertaining a large social affair or making the most of quality time with the family, food prepared and served in a natural setting just seems to taste better. 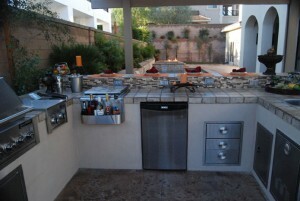 Essential to any outdoor kitchen is the grill and ample countertop space nearby. Adding the convenience of a refrigerator and sink can increase the value of the home by qualifying it as a second kitchen. From simple barbecue islands to complete grilling and cooking centers to brick pizza ovens, the experts at Laguna can design and build an outdoor kitchen that caters to the way you cook and the food you love to eat. It may even become more popular than the one indoors. 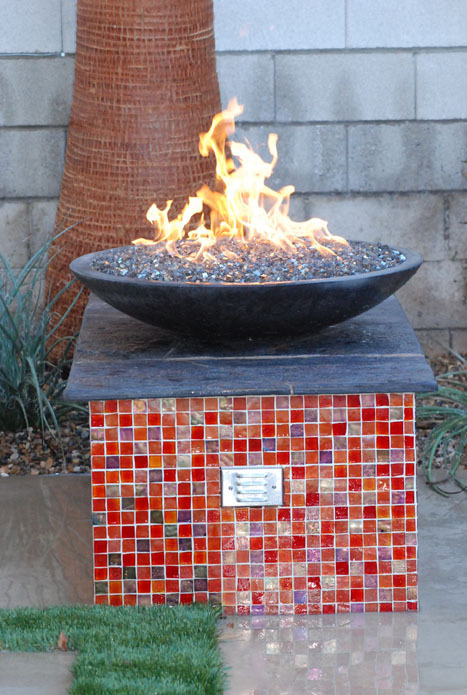 If you want to entice family and friends to share in the pleasures of an outdoor living space, incorporate a fire pit or fireplace. Gathering by the glow of a flame provides warmth on a crisp evening and stimulates social interaction. 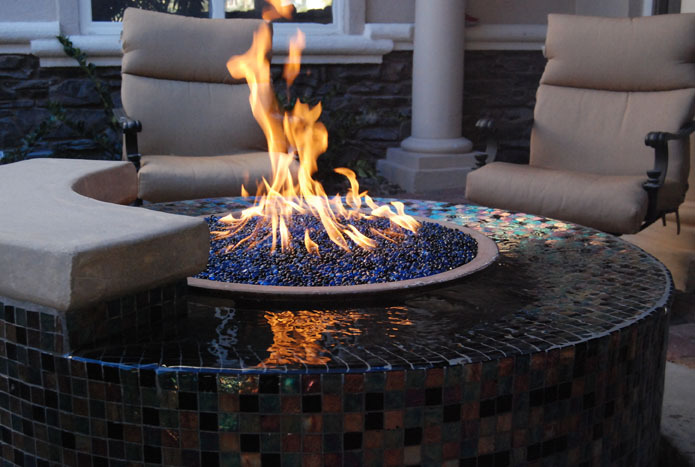 Plumbed for gas, a fire pit or fireplace becomes ablaze whenever the mood strikes without the air quality concern that comes from burning wood. Have Laguna show you the true power of the flame and its ability to bring people together. Still water brings tranquility and peace to any landscape. It sparkles and glistens in the sunlight and changes reflections throughout the day. We are mesmerized and the effect it has on us is almost hypnotic. A garden pond can teem with life: water lilies, fish, turtles and frogs, yet it creates a calm and serene atmosphere. 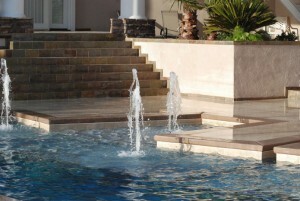 A thing of beauty in the sunshine, a water feature can be very dramatic at night with proper lighting. An entire pool can glow or display a kaleidoscope of colors with underwater fixtures. Dark water becomes mirror-like and can multiply the visual impact of the surrounding custom landscaping and interesting architecture of the home. 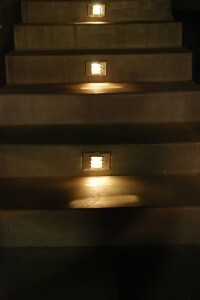 Well- directed lighting will make the movement of a babbling brook or tumbling waterfall more animated. There is always room for a water feature, even if space is limited, for it only takes a small amount of water to sooth the soul. 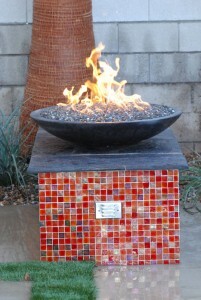 Tabletop or wall mounted fountains are self contained and available in sizes and styles to suit any need and taste. Whatever your individual preference or desired effect, the professionals at Laguna can integrate water into your outdoor retreat to create an oasis that overflows with personality. 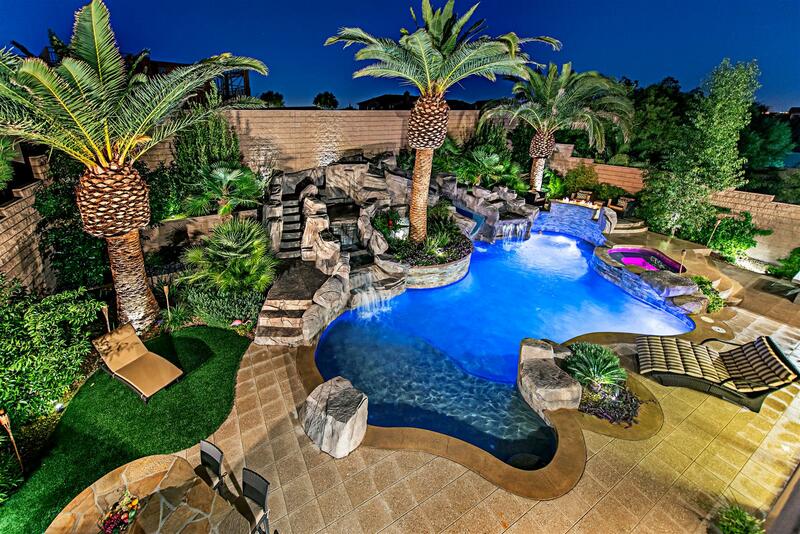 Your outdoor living environment, whether it is centered around a swimming pool, outdoor kitchen and dining center or a secluded spot within your custom landscaping, must include a place to escape from the intense rays of the desert sun. Shade structures are not only practical, but also offer the homeowner unlimited design possibilities. These retreats can be attached to the house or freestanding, level with the deck or raised and completely covered with a roof or partially open to the sky. The design of the structure will be guided by the site location, the architecture of the house and the lifestyle of its inhabitants. Arbors, pergolas, trellises, palapas, ramadas, pavilions and gazebos all offer some degree of protection from the elements and privacy from the neighbors while allowing the cooling breeze to carry in the delightful sounds and fragrant scents of nature. 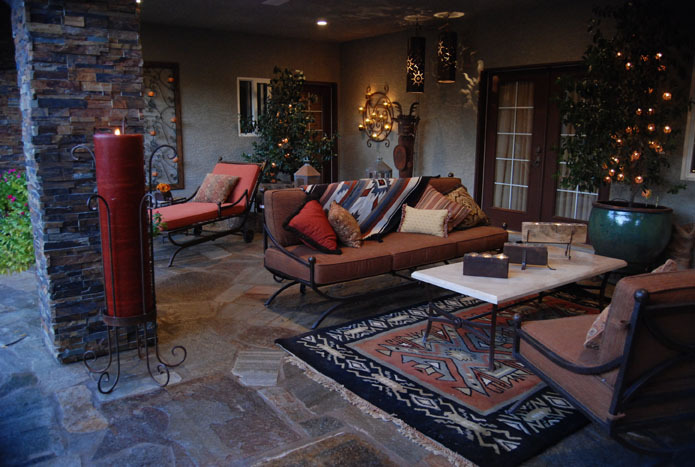 Decks and patios make a home feel more spacious by extending the living area outdoors. As a new addition or an upgrade to an existing yard, they function as the flooring of an outdoor room and can be accessorized to suit the needs, lifestyle and taste of the residents. Surface material selections are vast and the amount of use, the purpose of the outdoor living space, the architectural style of the house and budget must all be taken into consideration before making a decision. 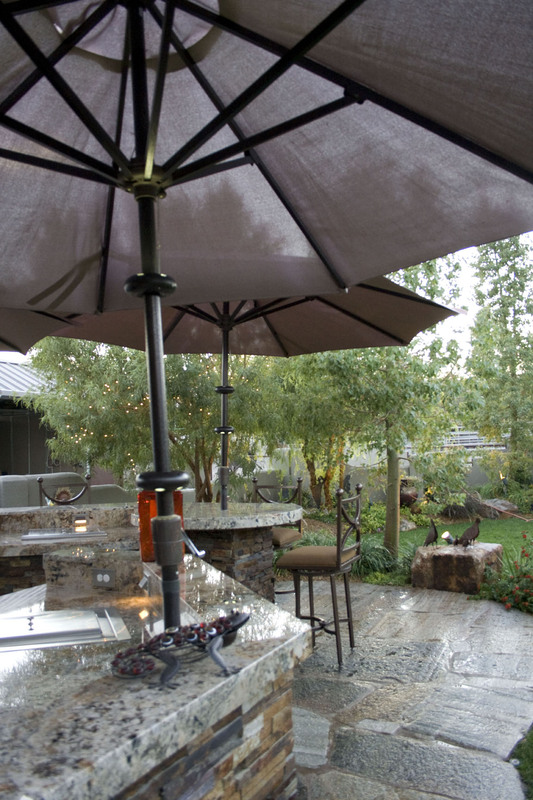 Lighting is an important element of the outdoor living lifestyle since the majority of time spent in the yard is in the evenings. Its practical purpose is increased safety and security around the swimming pool, spa and landscape. A well designed lighting plan will also create an enchanting evening atmosphere extending your hours enjoying the open air. Laguna’s experienced designers use artistic effects and a variety of fixtures to achieve a desired mood, whether subdued and romantic or theatrically stimulating. With the dramatic contrast of light and shadows, architectural details of the home are enhanced and attention is focused on striking features within the landscape. Directional lighting can be manipulated to define interesting forms, emphasize textures, cast mysterious silhouettes or create breathtaking reflections that can be observed from indoors as well. 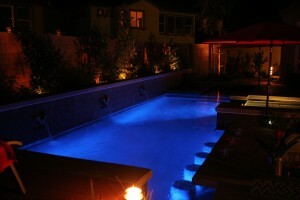 Let us show you how the quality of outdoor lighting relates to the quality of outdoor living. The great outdoors appeals to both the young and old, everyone needs their own place in the sun. Having fun in the open air is a favorite way for families to spend time together, or for adults to act like kids again to relieve the stress of everyday life. Either way the intent is recreation and the result is healthy exercise. 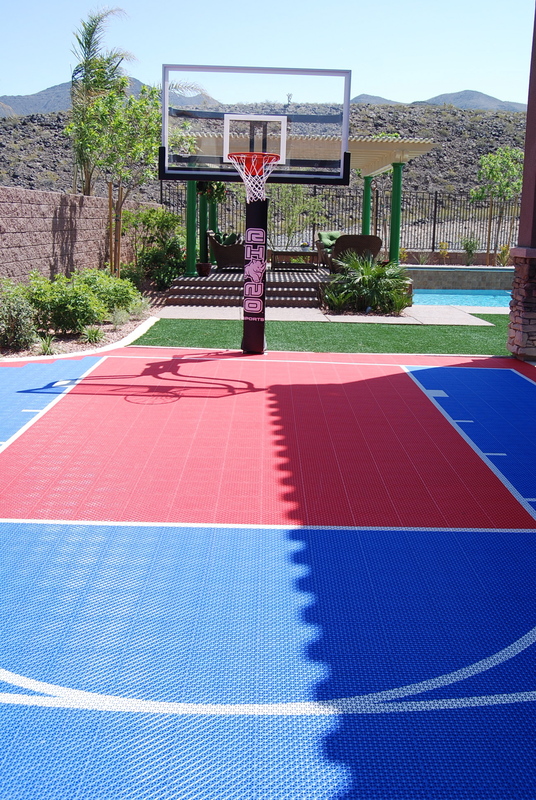 Whether you want a putting green to keep your game up to par, a court to shoot hoops or swing a racquet with friends or a safe dedicated play area geared to the interests of the children, the space and equipment should be an integral part of the landscape. 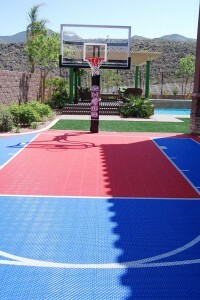 Depending on the age of the kids and the activities the family enjoys, an enclosure may be required. A secure fence allows young ones the freedom to run and play while still establishing boundaries. The area you designate should encourage multiple activities and be able to grow and change, as do members of the family. 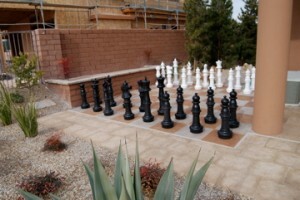 Anything you can imagine for fun, the designers at Laguna are available to help you make your backyard a place where the family can safely play for years to come. 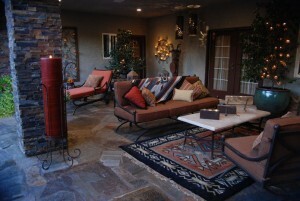 No outdoor living area is complete without accessories. They are the finishing touches that not only personalize the space, but also increase its comfort, functionality and aesthetics. Furniture, and more specifically tables and chairs, are the accessories used most often. 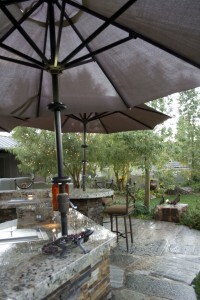 Choose only well made pieces that are water and fade resistant, maintenance free and able to stand up to the elements. This also makes them more eco-friendly. Cushions should be made of high performing outdoor fabric, such as canvas, or specially treated for exterior applications. Garden containers are ideal for softening solid surfaces with greenery or splashes of color from flowers or the planters themselves. They add style to an outdoor setting and can be used as borders to define open air rooms or to direct traffic to destination points. 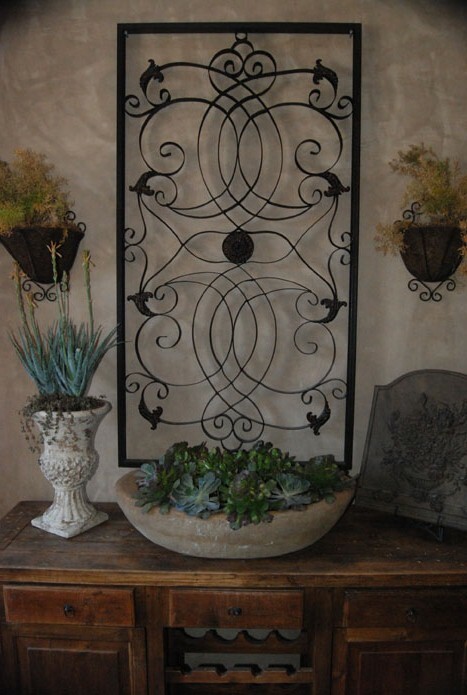 Most any container can support vegetation if you drill holes in the bottom, and incorporating recycled materials is an environmentally sensitive approach to making the space unique. Think of unexpected ways to use art and decorations in the garden. In the Southwest where block walls and slight breezes are a constant, art can be used as a camouflage and spinners, chimes, bells and vanes can take advantage of the wind. The knowledgeable staff at Laguna is happy to take the time to assist you in finding the perfect pieces to compliment your outdoor room with comfort, character and creativity. Laguna takes the responsibility of being green very seriously. 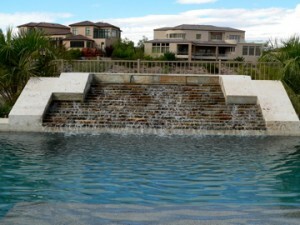 Our clients help to determine much of what is used to complete their one of a kind swimming pool and custom landscape. During the selection process, we take the opportunity to educate the homeowner about equipment and materials that are recycled, environmentally friendly and energy efficient and explain the benefits of conservation. Wood substitutes made from reclaimed wood and plastic are sturdy, long lasting, attractive and installation helps save our dwindling forests. 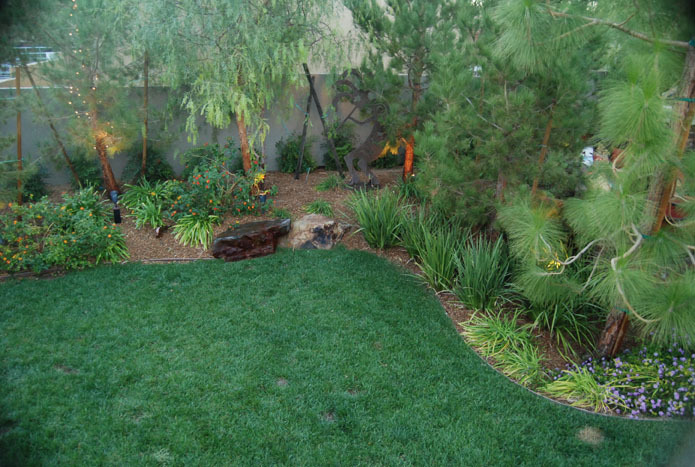 Synthetic turf gives the appearance of a natural lush green lawn without consuming water, our most precious resource in the desert. For those who prefer real grass, we improve the soil and design efficient irrigation systems that consume less water. Durable materials last longer and have to be replaced less often, reducing the trash eventually ending up in landfills. Concrete is ecologically sensitive since it is not cut down, synthesized or kiln dried and measured for the project at hand, thereby wasting little or none at all. The use of variable speed pumps and solar heating for pools and spas is encouraged to save power and decrease the emission of pollutants into the atmosphere. The technological advances in LED lighting make it possible to illuminate an area using less than 50% of the energy. LED’s are not only brighter while consuming less electricity, they last far longer than incandescent bulbs and often come with a warranty of up to 15 years. At Laguna, we believe that to live in harmony with the environment you must give it respect and do everything you can to conserve and protect nature.